Using state-of-the-art technology, TimeLeapVR develops authentic, informative and customizable art experiences in Virtual Reality. After the deferential study of the original from a distance, it suddenly becomes explorable, perceptible, and palpable through the possibility of entering it in Virtual Reality. Such a personal and interactive involvement into an artwork offers new perspectives to art enthusiasts and entices those who had not found a gateway to the art world before. 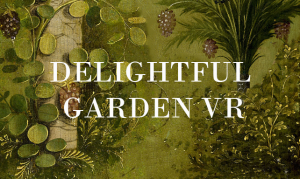 State-of-the-art Virtual Reality technology makes classical paintings come alive. By using cutting-edge game engines, we can respond flexibly to the potential as well as the challenges that arise from the individual work of art. Room Scale VR enables the viewer to move freely within the realm of the artwork: movements of the body, head and hands are mirrored into the virtual world realistically. Not only does this enable interaction, but also creates a strong sense of immersion and presence inside the experience. Thanks to 3D sound, the soundscape adjusts naturally to the position of the viewer. The artist’s individual style as well as the specific characteristics of an artwork are recreated by TimeLeapVR. Every single detail of a painting – from the brushwork and the color scheme to the structure of the canvas – is transferred into the experience authentically. The backstory of the painting is elaborated in collaboration with art historians and museums and integrated into the experience in form of dialogues, interactions and storytelling, thereby securing a learning effect. In a museum, artworks and their specific background information are usually presented separately. Unfortunately, the connection between the two can get lost in the process of viewing or seem cryptic to a particular audience. TimeLeapVR combines both elements to create one singular modern art experience which is informative as much as it is entertaining. This works because the viewer’s personal involvement in the story, his interactive participation in the events and the incentive of concrete tasks initiate an autonomous exploration and investigation of the artwork. This allows him to gather information on all those aspects that he is particularly interested in – independently and at his own pace. TimeLeapVR enables an individualization of the art experience: with regards to content and audiovisual realization, its style can be adjusted to individual target and age groups as well as their interests and knowledge. In line with the educational turn, TimeLeapVR is developing a modern methodology which allows for the democratization of the access to art knowledge for people of all ages and with different demographic, social as well as educational backgrounds.